Remember back to the early nineties when the internet was largely something you logged into to check your personal email? Many big brands, let alone small businesses had little or no website presence, social media wasn’t even a thing and financial institutions wouldn’t even consider connecting their infrastructure to such a scary thing. Well those days are gone. Now the internet is not only a significant part of a small business, it has become the underpinning of everything civilization is and does internationally. Could you imagine if your small business was suddenly cut off from the internet? Exactly that, or something close is a real possibility for today’s small business owner and you need to arm yourself with the knowledge needed to protect your small business from a devastating cyber attack. According to a study conducted by Nationwide Insurance late last year, 79% of small businesses don’t have a cyber attack response plan. What’s more, 63% of those same business owners admitted they have already been a victim of at least one type of cyber attack. This should make every small business owner cringe, then focus on making this cyber attack threat a real priority in their company. Why don’t small business owners have a cyber attack plan? 46% of small business owners believe their current business software is secure enough. 40% of small businesses said that they don’t think that their company will be affected by a cyber attack. Yet a huge 74% said that they are at least somewhat concerned about a potential cyber attack. Is it just us, or do these small business cyber attack statistics seem to contradict themselves? 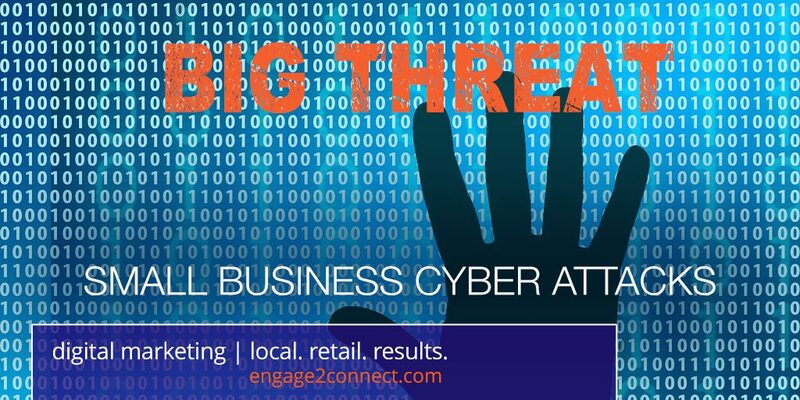 It appears that many small business owners have some real concerns about the threat of a cyber attack, but just don’t think it could happen to them. We would ask those of you reading this to take a sober look at your situation and the threat it represents to your business and customers. The threat of cyber attack facing small business is quite real. Though the above data seems to show that many small business owners don’t think it could happen to them, the facts show it not only can happen to you, but it already has happened to many! Let’s look at what the study shows. 63% of small business owners say they’ve already been a victim of at least one form of cyber attack. Though some of these may not be something you have had to deal with, they are actually very real threats that every small business should take seriously. For just a moment, let’s also consider how any one of the types of cyber attacks listed above could impact your small business from marketing, reputation or digital control standpoints. Imagine if a phishing attack (an attempt to trick you into unknowingly providing your login/PW information) allowed hackers to gain access to your business social media accounts? What if a phishing attack allowed a hacker to take over your Yelp, email software or other online business reputation profiles? This is a real threat that businesses need to take extremely seriously! As we have seen many times, if you are a huge brand with unlimited staff, resources and capital, you can withstand a large data breach, social account hack, or other cyber intrusion. We’ve seen many large corporations go through this and come out the other side over time, without being completely destroyed. But as a small business, you don’t have the same resources. Could your small business withstand an extended cyber attack that takes over your website, your social accounts or reputation/review sites? For many the answer is no, yet it remains a significant threat that is not being addressed by most small business owners. We created this post to accomplish two things. First we wanted to make sure you and your small business were made very aware of the risks associated with cyber attacks. Secondly we wanted to provide your small business with cyber security resources that would help you. Here are a list of additional small business cyber security sites that we suggest you review and then utilize to improve your cyber security and thereby reduce your risk of successful cyber attacks in your small business.